A cult-favorite moisturizer that effectively smoothes and improves the complexion. This third step in Clinique's 3-Step Skin Care System was designed by Clinique's dermatologists to maintain optimal moisture balance for dry-to-combination skin types. The lightweight "moisture drink" slips easily onto the skin and absorbs quickly, leaving skin comfortable, soft, and healthy looking. Water, Mineral Oil, Glycerin, Petrolatum, Stearic Acid (emulsifier), Glyceryl Stearate (emulsifier), Sesame Oil, Urea, Lanolin Alcohol (thickening agent), Triethanolamine (pH balancer), Barley Extract, Cucumber Extract, Helianthus Annuus (Sunflower) Seed Cake, Propylene Glycol (carrier), Dicaprate (conditioning agent), Sodium Hyaluronate, (solvent), Pentylene Glycol (humectant), Trisodium EDTA (chelating agent), Phenoxyethanol (preservative), Yellow 6 (CI 15985), Yellow 5 (C1 19140), Red 33 (C1 17200). Water, Mineral Oil, Propylene Glycol, Sesame Oil, Stearic Acid, Glyceryl Stearate, Petrolatum, Lanolin Alcohol, Triethanolamine , Trisodium EDTA, Phenoxyethanol, Yellow 6, Yellow 5, Red 33. Clinique’s Dramatically Different Moisturizing Lotion Plus comes in a pretty plastic packaging (travel-friendly) with a transparent lid which closes with a click. It comes with a pump ~ hygienic and no wastage. The lotion is pale yellow in color and the consistency is just fine ~ not too runny, not too thick. 2-3 pumps is enough for my whole face and neck. Though the lotion is meant for Very Dry to Dry Combination skin, it feels heavy on my dry-combination skin. It does not sink into my skin and makes it look oily and sticky. However, if I mix a little bit of it with my sunscreen, it works just fine. Therefore, I can't wear it alone on my face during the day time but I think it can be worn at night. I would recommend it to people with Very Dry to Dry Skin only. With a heavy price tag of 2850 for 125 ml) and 1500 INR for 50 ml, it breaks my heart to see the first ingredient of this product, after water, i.e. Mineral Oil. Mineral oil and Petrolatum are inexpensive petrochemical byproducts made from petroleum. Mineral Oil is commonly used to remove makeup because of its ability to cut through grease and dirt. Its a popular moisturizing ingredient but has some adverse effects as well. By locking in moisture, mineral oil forms an impenetrable film over skin that traps in toxins and hinders normal skin respiration. Not only does it create a heavy feeling, but it can also plug up pores and lead to breakouts. Glycerin Glycerin is a humectant that can be naturally derived from plant oils, or it can also be synthetically produced. As a humectant, glycerin works to moisturize the skin by drawing water from the air into the skin's outer layer. It also forms a protective layer that helps prevent moisture loss. However, the moisturizing effects of glycerin are dependent upon the climate — if the air has less than 65% humidity, glycerin will draw moisture from the lower layers of the skin and hold it on the surface, drying the skin from the inside out. Another drawback is that products formulated with high levels of humectants such as glycerin will leave a tacky feel on the skin. Sesame Oil ~ With the same molecular structure as a human lipid, it provides moisture, prevent water evaporation, and leave a wonderful soft and supple texture on the surface of the skin. Sodium Hyaluronate is a safe and effective moisturizer. It mimics hyaluronic acid produced naturally by the body and is non-irritating to skin. Barley Extract is used for astringency, soothing and skin repair. Urea is an interesting humectant. It is found in the skin’s tissues and makes up to around 7% of our natural moisturizing factor. It helps to maintain a healthy moisture balance within the outer layer of skin. Cucumber Extract has an extremely soothing effect on the skin. Composed of 90% water (cooling action), amino acids, proteins, lipids, and Vitamin C that serves as an antioxidant that help soothe, calm skin irritation, and relieve puffy skin. Sunflower Seed Cake is a residue from the expression of oil from the seedcake of the sunflower, Helianthus annuus. Its a abrasive, absorbent and bulking Agent. I see it doing no good to the skin ( I maybe wrong ). The only active ingredient, that did real good to your skin (apart from Mineral oil and Petrolatum) in the earlier version was Sesame Oil. Also it had parabens (not mentioned in the list). The new version has few new ingredients like Glycerin, Urea, Barley Extract, Cucumber Extract, Sunflower Seed Cake, Propylene Glycol (carrier), Dicaprate (conditioning agent), Sodium Hyaluronate and Pentylene Glycol (solvent). 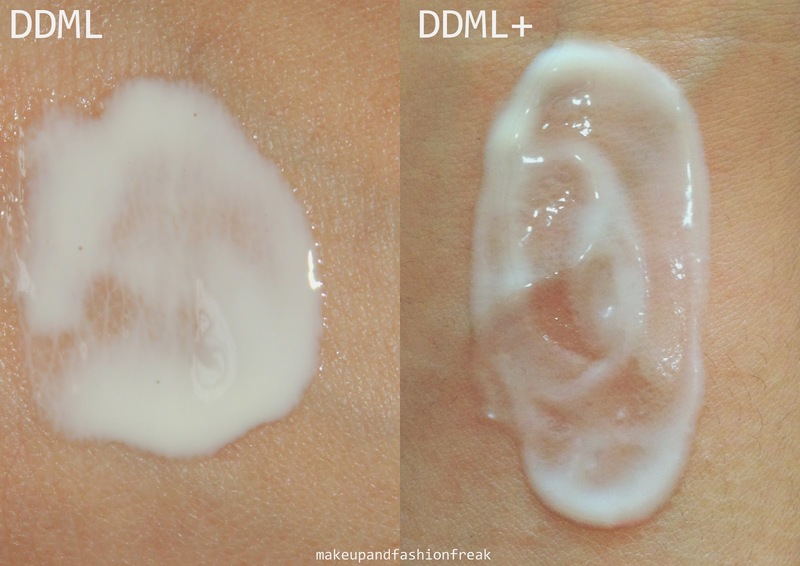 Having said that, the earlier version (DDML) worked better for my Dry-Combination Skin. It used to get absorbed real quick leaving no sticky feeling behind. 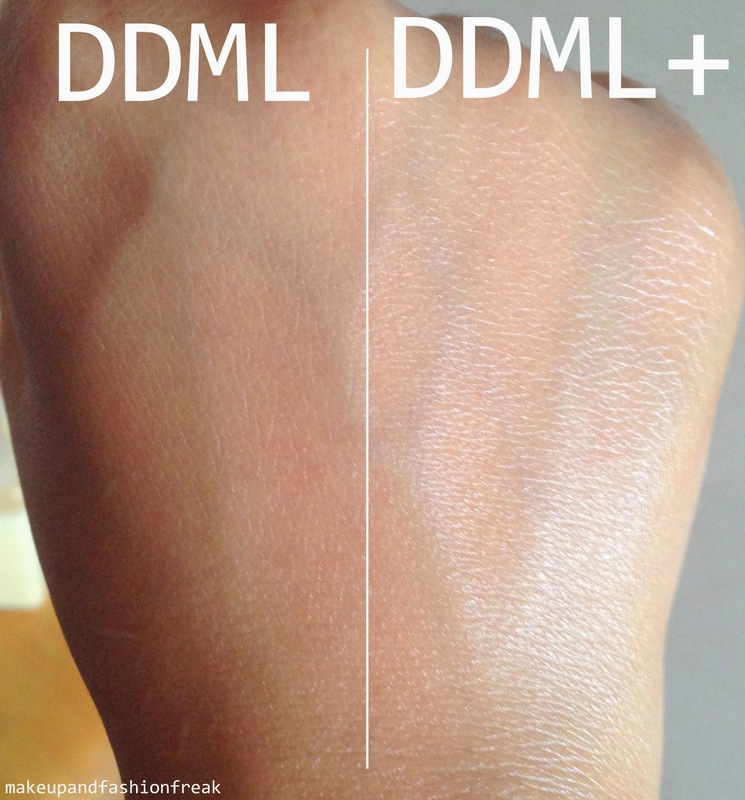 On the other hand, the new version (DDML) feels heavy on my dry-combination skin. It does not sink in and makes it look quite oily and sticky. It might work for those with very dry skin. Also, the DDML+ smells a bit different. Comes with a pump to avoid wastage. It contains few nice ingredients which actually does good to your skin. Contains Mineral oil and Petrolatum which usually clogs pores and causes breakout. Does not sink in and skin looks oily. Does not work for Dry-Combination Skin (the old version did). I think I am not going to re-purchase this product. Its expensive, contains mineral oil, does not sink in, feels oily and did not work at all for my Dry-Combination Skin. For those with Very Dry or Dry skin may give it a try.